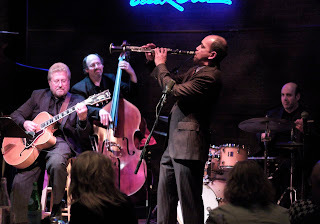 On Sunday night, Oct. 25, Dakota Jazz Club owner Lowell Pickett gave us a gift, and New Orleans clarinetist Evan Christopher delivered: more than two hours of music that took us back and forth in time, filled us with rhythm, honored roots, insisted on relevance, and left us breathless and giddy. Pickett flew Christopher to town for the Dakota’s annual members’ party. (If you live in the Minneapolis/St. Paul area and want to know more about Dakota memberships, click here.) The first part of the evening (cocktails and apps) was private, the second (music) was open to the public but not terribly well advertised. By the time the music started, the club was full. 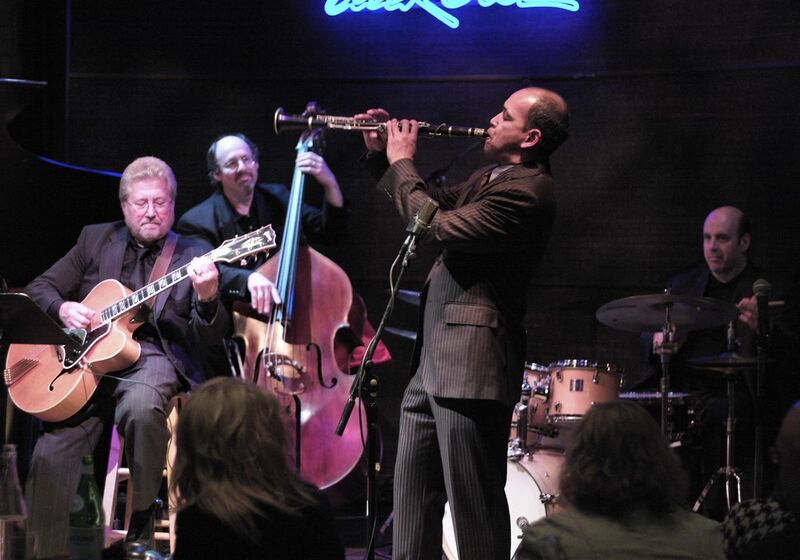 I’ve heard Christopher play before—with the New Orleans Jazz Orchestra, at the Dakota (after a NOJO show at Orchestra Hall), at Chickie Wah Wah on Canal Street in New Orleans, where he has a regular gig. 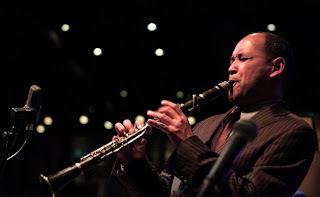 More than any other artist, he has opened my ears to New Orleans music: not the kitschy, touristy stuff often associated with NOLA but the living, breathing, kicking sounds of the place where jazz was born and is still evolving. When he plays, I hear the old tunes, the old sounds, but the way they sound today, this minute. Christopher is his own cat, but I’m reminded of Marcus Roberts when he plays. Not because they’re from the same place or doing the same things (and they don’t even play the same instrument), but because each is a scholar and a historian with deep, deep roots in the past, yet their music is very modern. Listen to Roberts play “Jitterbug Waltz” on his latest CD, New Orleans Meets Harlem, Vol. 1 (J Master, 2009) and you’ll think that tune was written today, not in 1942. [While you’re at it, if you can, listen to Roberts play the same tune on As Serenity Approaches (Novus, 1991). Another just as modern, totally different approach.] Christopher performed it at the Dakota as his encore. My dream jazz club date: Christopher and Roberts together on the same stage. Joined by area musicians Tanner Taylor on piano, Reuben Ristrom on guitar, Gary Raynor on bass, and Joe Pulice on drums, Christopher played for two hours without a break, which nearly killed a certain member of the band who smokes. The music was full of joy and emotion and virtuosity. The crowd was rapt and attentive. The only people who left before the end were a couple with small children; this was a school night, and the parents looked back in regret as they headed for the door. Christopher is an artist who educates from the stage, telling us what he’s playing, sharing interesting stories and anecdotes without filler or shtick. Here’s what we heard. 4. Music by Cole Porter associated with Louis Armstrong, including selections from the musical comedy Jubilee and the film High Society (“I Love You, Samantha”). Christopher sang. This, too, is a New Orleans thing. Musicians lower their horns and sing a verse or two. 9. He ended with a rousing, celebratory second-line version of Oscar Hammerstein’s “When I Grow Too Old to Dream,” playing and singing (“When I grow too old to dream/I’ll still have you to remember”). By now we were all stiff from sitting. If we weren’t dopey Minnesotans, we would have gotten up and danced around the club, out the door, and down Nicollet Mall, buses and taxis be damned.